My name is Prateek Pinisetti, and I started ChessHelps as well as this website when I was thirteen. I was just about to begin high school at Basis Chandler. I had played chess for five years by then, and had participated in innumerable tournaments locally and nationally. However, I wanted do something with chess other than playing it. I first started playing chess at the relatively old age of 8 (most high level players start in kindergarten/first grade) when I was in third grade at Kyrene de las Brisas Elementary's chess club. Coach Sean Tobin was my first chess coach and I am still blown away at how he managed to cultivate the love of the game to his young students. The club was really popular with about thirty kids .We had all kinds of chess-related fun, we went to tournaments, won team trophies and played speed chess. The picture below was taken in third grade. Here is one of our first team trophies. I'm in the back right corner, and Coach Sean is in the back left. The very next year, I started playing in USCF (United States Chess Federation) tournaments ,and my first USCF rated tournament was the AZ State Grade Championship. I placed fourth in my section and was absolutely thrilled about my shiny new trophy. My love of the game only continued to increase after this. Here's a picture of me and Coach Sean after the event. After that I won several state championships, but one of the sweetest was winning the State Junior High School Championship while I was only in sixth grade. FM Robby Adamson one of the top chess coaches in the state was my coach at the time. Robby is a coach who can really bring out the best in you, and has won many national team titles at Catalina Foothills in Tucson, where he coaches the chess team . Here I am with my blitz and main event trophies. Later I went on to win two USCF National titles, in 7th and 8th grades, and placed in top five in both 9th and 10th grade. It was a great year, as we won the team title as well as me winning the individual title. This was definitely one of the highlights of my chess career. On the left is my 8th grade picture with my team (Jake Hum and Rahul Reddy). I started teaching chess to youngsters and always think back to Coach Sean on how he did it and try to use similar techniques to engage the student and to inspire them to improve and enjoy the game at the same time. 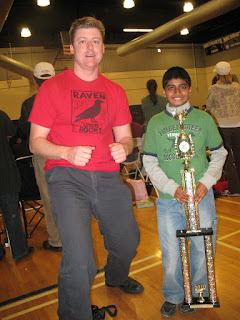 I teach chess at at Chandler BASIS Primary (south campus) along with my good friend Manu Reddy.